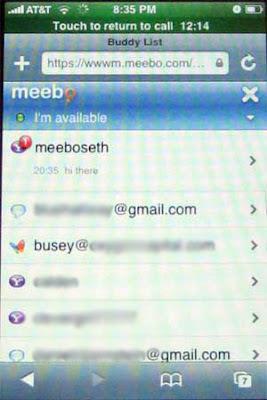 "Facebook may have the best looking iPhone site to date, but Meebo for the iPhone is more useful, as it brings instant messaging, finally, to that phone. ICQ, AIM, MSN, Yahoo, and Jabber/Google are supported. Meebo took its time building the site, which is actually their first mobile application. There is no special URL, just go to meebo.com from an iPhone and the browser will load the correct code. The application scales either way you hold the phone (I recommend vertically to see contact, horizontally to chat - see pictures). All of your settings from Meebo are retained on the iPhone, including any avatar you’ve created. And people who you’ve had recent conversations with are always listed on the top of your buddy list..."